Our Trinity Family is growing bigger and stronger. 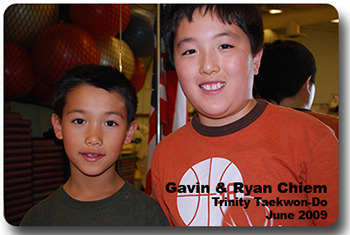 Through our friendships and time together, the opportunity to share our experience together is what Trinity Taekwon-Do is founded upon. This site lifts up and extols the students, brothers, sisters, and families that call Trinity their "Home away from Home". 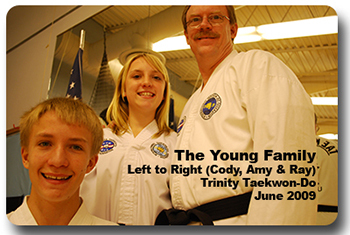 The Young family are one of several family groups that train together and only recently are the newest 2nd Degree Black Belts at Trinity Taekwon-Do. 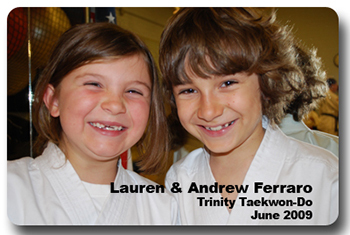 Megan and Nathan Yeo have been at Trinity since the beginning of their Taekwon-Do training. Now four years later we're excited to see their progress and growth. 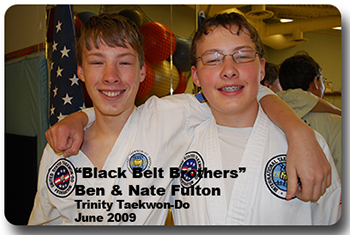 Ben and Nathan Fulton are two other brothers and long time "Taekwon-Do Brothers" at Trinity. The Fishers are new arrivals this year, but welcomed into the Trinity Family just the same. 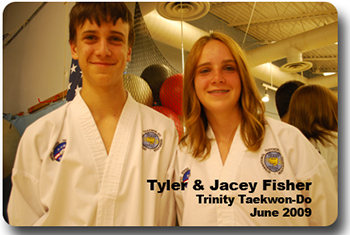 Tyler is a strong jumper and Jacey is growing in the Taekwon-Do spirit. 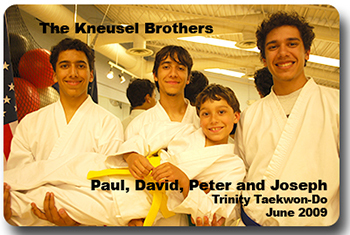 The single largest family at Trinity... the Kneusel brothers are now joined by their youngest brother, Joseph. 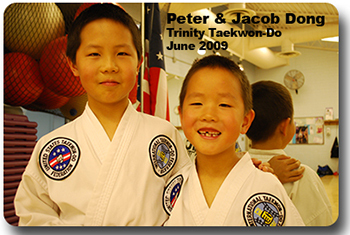 The strength of these brothers and their ties bind our Taekwon-Do family at the seams. 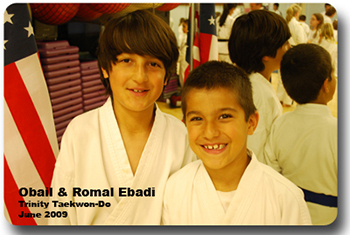 The Ebadi brothers are now half way in their journey to become a Black Belt. 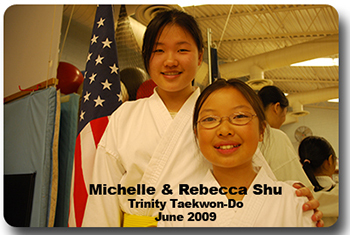 They continue to improve and their strengths friendship with the other students. The Ferraro kids are just new to Trinity. 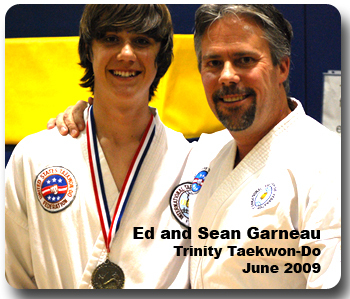 While their Mom and Dad had trained with us years ago, the tide has changed and a younger plant now grows. This brother and sister are having fun together. The Hans, like the Chiems, are only newcomers to Trinity. 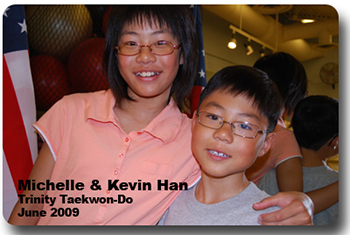 But there taking to Taekwon-Do like "fish in water". Our newest members have hidden talents just waiting to be seen. The Jaminets have been at Trinity now for six months and what a joy. 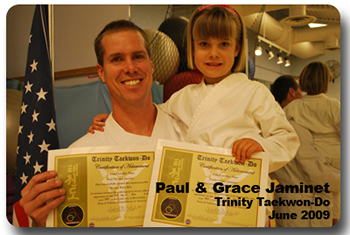 Paul is a strong role model for all the white belts and illustrates strong leader skills. Grace embodies pure innocence...the simple elegance of a young white belt. 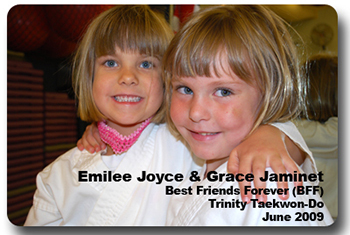 In separable, Emilee Joyce and Grace Jaminet, are best Taekwon-Do friends. Always giving out hugs and warm smiles. These young students are the joy and blessing of Trinity. The Shu sisters are up and coming. Already recognized amoung the "top of the pack", we can foresee big things from these two sisters at Trinity.